The next time you’re in a big city with a bike-sharing program, and you’re worried about riding a shared bike on unfamiliar busy streets, remember a new study out that reports that bike sharing, which has seen rapid growth in the last 10 years, has not led to a death of any cyclists yet. Using the metropolitan bike shares (like Citi Bikes in NYC or Hubway Bikes in Boston) is safe and fun! 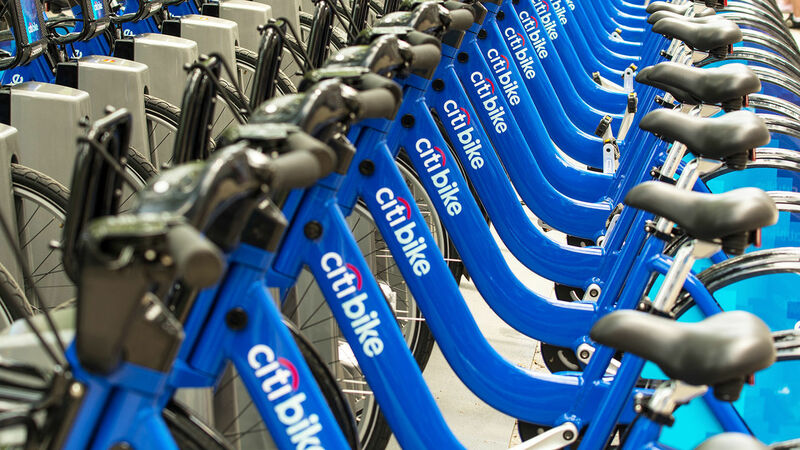 While many critics worried that city bike shares would be dangerous, the actual evidence from millions of rides from across the U.S, is that bike shares are very safe. Bicycle safety experts have long known that the single biggest factor to increased bike safety is an increased number of bikes on the road because motorists become more aware of the presence of bikes, and bike sharing in cities once again proves that point. Researchers found that bike-share riders tend to get into far fewer crashes than other cyclists, according to a report from the Mineta Transportation Institute, which looked at data from bike-share systems in Washington, D,C., San Francisco, and Minneapolis. A Vox story on the report has some great links worth checking out, too. Here is a summary of the study …. 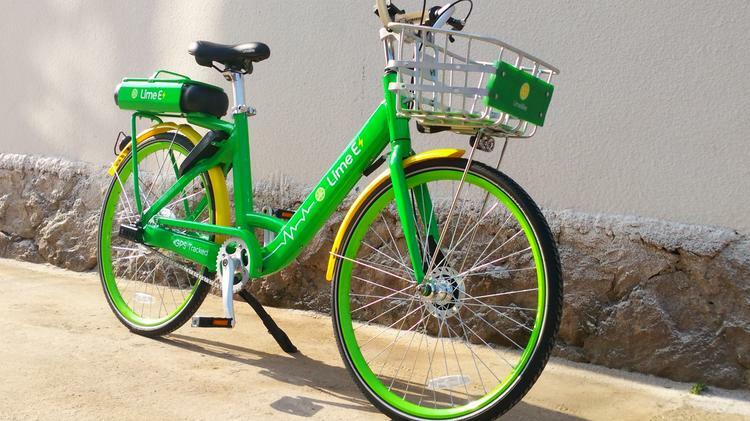 Bike-sharing systems are in more than 90 cities and riders have taken more than 35 million trips. No deaths reported in bike sharing, while the overall estimated cycling fatality rate is 21 deaths per 100 million trips. Design matters. Bike-share bikes are heavier and have wider tires, so they are built for rough use and potholes, a big source of accidents for cyclists. The bikes have fewer gears, so riders can’t go very fast. Their drum brakes perform better when it’s wet. They are usually painted bright colors and feature flashing lights, so they are easier for drivers and others to see them. 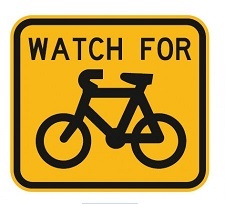 Drivers are more alert and usually drive slower in congested city downtowns, so they are less likely to hit bicyclists. 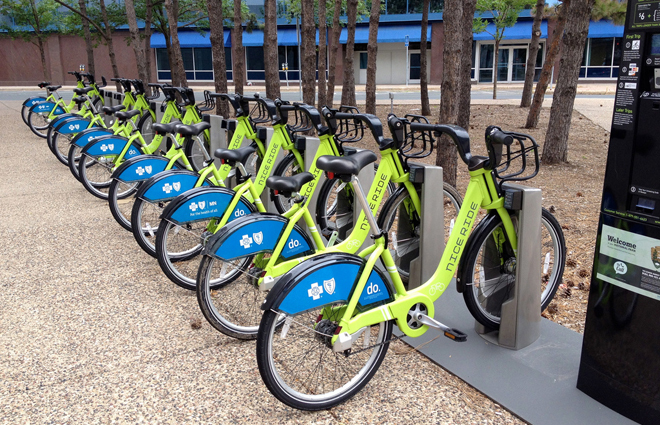 Bike-sharing often attracts new and inexperienced riders, who are more likely to be cautious and alert. 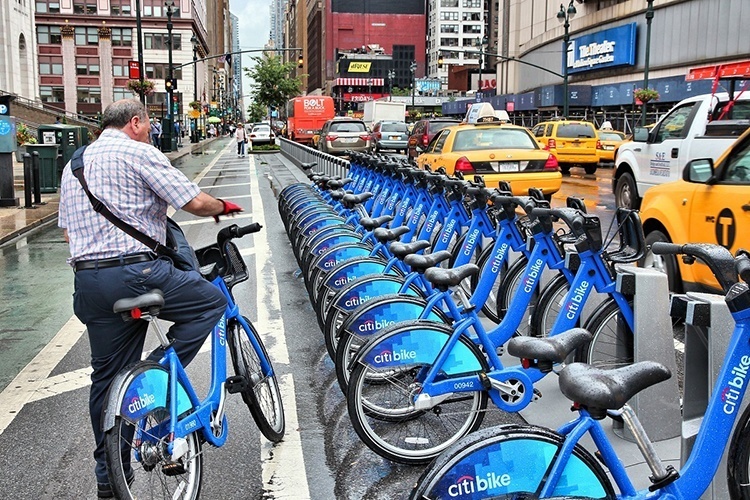 Bike-sharing riders use helmets less than other riders. Some say drivers are more careful around cyclists without helmets. With that said, I want to be clear that I ALWAYS recommend that everyone wear a helmet because helmets certainly do help in some situations and helmet-use sets a good example for children who are legally required to wear a helmet. I recommend reading the full report. Have you ever used a bike share? If you have, what do you think of the study’s conclusions? What was your experience like? Please share your comments below! This entry was posted in Bicycle Accident Cases in Court, Bicycle accident lawsuits, Bicycle Accidents, Bicycle Collisions, Bicycle commuters, Bicycle commuting, Bicycle Safety, Bicycle sharing program, Bike accidents, Bike collisions, Bike sharing program, Cool Stuff for Bicyclists, Risks for Bicycle Riders, Uncategorized and tagged accident attorney, accident lawyer, Bicycle, bicycle accident, bicycle accident attorney, bicycle risks, Bicycle Safety, Bicycle sharing system, bike accident, Cycling, Elmira, Elmira New York, James B. Reed, Jim Reed, New York, New York bicycle accident lawyer, New York City, ny bicycle accident, ny bicycle accident lawyer, pa bicycle a, pa bicycle accident, pa bicycle accident lawyer, pa bicycle law, Twin Tiers, Ziff Law Firm on April 28, 2016 by Jim Reed. The League of American Bicyclists has released its Fall list of Bicycle Friendly Businesses across the United States. These are businesses that encourage employees to bicycle to work, and perhaps even offer incentives to ride to work. These businesses sometimes organize staff rides and actively help in building a Bicycle Friendly Community. These businesses provide safe and secure bike parking, and showers and changing areas for those who ride to work. They also provide a repair area and advocate in their community for dedicated bike paths so employees can commute safely. These businesses also provide safety information and bike maps, and when possible, encourage employees to attend skills and maintenance classes. Educating motorists about safely sharing the road is another key component. Finally, the businesses sometimes have a volunteer bike coordinator who coordinates events and surveys co-workers about their commuting habits. Go Bike Buffalo, a nonprofit agency, with 10 employees. Ingalls Planning & Design of Fairport in Rochester, an architecture, planning and design company, with three employees. Hart’s End LLC in Rochester, a food retailer in Rochester, with 68 employees. R Community Bikes in Rochester, a nonprofit agency, with 80 employees. Steinmetz Planning Group in Rochester, a professional services agency, with two employees. 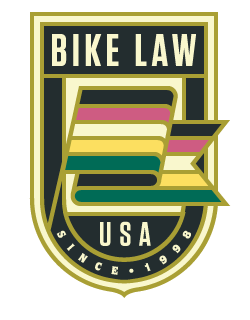 In all, the League of American Bicyclists welcomed 43 new and renewing Bicycle Friendly Businesses (BFBs) to the Bicycle Friendly America program. More than 1,090 businesses from across the country have earned this status over the past seven years. I know of at least one local business that is bike-friendly: C Tran, the Chemung County bus system. Jim Arey, the director of the Elmira-Chemung Transportation Council, said most of the buses have bicycle racks that can carry two bicycles. “We have a policy that all new buses will have such bicycle racks. 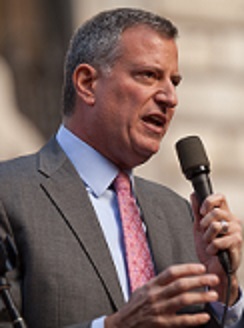 You see bicyclists using the racks on the buses,” he said. The Transportation Center downtown also has two multi-station bicycle racks. Now it is time for other local businesses to accept the challenge. What does your business or organization do to encourage and support bicycle commuters? Please respond below, in the comments section! This entry was posted in Bicycle Accidents, Bicycle Collisions, Bicycle commuters, Bicycle commuting, Bicycle Laws, Bicycle Safety, Bicycle sharing program, Cool Stuff for Bicyclists, League of American Bicyclists, Uncategorized and tagged accident attorney, accident lawyer, Bicycle, bicycle accident, bicycle accident attorney, bicycle risks, Bicycle Safety, bike accident, Cycling, Elmira, Elmira New York, James B. Reed, Jim Reed, New York bicycle accident lawyer, ny bicycle accident lawyer, ny bicycle cases, pa bicycle accident, pa bicycle accident lawyer, pa bicycle law, United States on December 17, 2015 by Jim Reed. Bake sharing program in some bigger cities will cost riders some money, but not the programs in the Twin Tiers. They are free. Near the walking trail at Sperr Memorial Park in Big Flats, between Kahler and Hibbard roads. At the Water Street entrance to the Lackawanna Rail Trail in Elmira. At the Watkins Glen Village Marina Bar and Grill at 2 Seneca Harbor in Watkins Glen. Bike shares are an awesome resource for riders from many different walks of life, including those who don’t have their own bikes; travelers who regularly ride but don’t want the hassle of dragging their own bikes along on their trips; and people who haven’t ridden bikes in years and want to try a short ride. A bicycle is such a great way to explore a new area because you can quickly cover a much bigger area than you can walking and you can see more remote, quieter areas in a much better way than being trapped in a car on the busy main roads. To learn more about bike sharing and how it works, check out the Southern Tier Bicycle League. The Star-Gazette newspaper earlier this month featured the new Sperr bike share shed, which got a boost recently from Brendan Marshall of Big Flats, a junior at Horseheads High School who worked on the shed as his Eagle Scout project. Brendan made many repairs, including painting the shed, replacing a wall and reshingling the roof. The bicycle shed has been at the park for about a year. So go enjoy the ride. It is free and fun! This entry was posted in Bicycle Safety, Bicycle sharing program, Bike Care Stations, Bike sharing program, Cool Stuff for Bicyclists, Southern Tier Bicycle League, Uncategorized and tagged accident attorney, accident lawyer, Bicycle, bicycle accidenet laws, bicycle accident, bicycle accident attorney, bicycle risks, Bicycle Safety, Big Flats New York, bike accident, Cycling, Elmira New York, Horseheads High School, James B. Reed, Jim Reed, Lawsuit, New York, New York bicycle accident lawyer, ny bicycle accident, ny bicycle accident lawyer, pa bicycle a, pa bicycle accident, pa bicycle accident lawyer, pa bicycle law, Star-Gazette, Twin Tiers, Ziff Law Firm on June 16, 2014 by Jim Reed. A group of Scouts had fun painting some of the bikes for the new bike sharing program. A Big Flats Eagle Scout is leading a project that is putting the finishing touches on an awesome new bike sharing program at Sperr Memorial Park in Big Flats. My congratulations to Eagle Scout candidate Brendan Marshall and other Scouts from Troop 3097 in Big Flats, who spruced up and repainted an old shed and a bunch of bikes for the bike share. What a great community project by some terrific youngsters! The white bike-sharing shed, which will soon have a sign, is located at the west entrance of Sperr Park near the intersection of Winters, Hibbard and Maple roads. 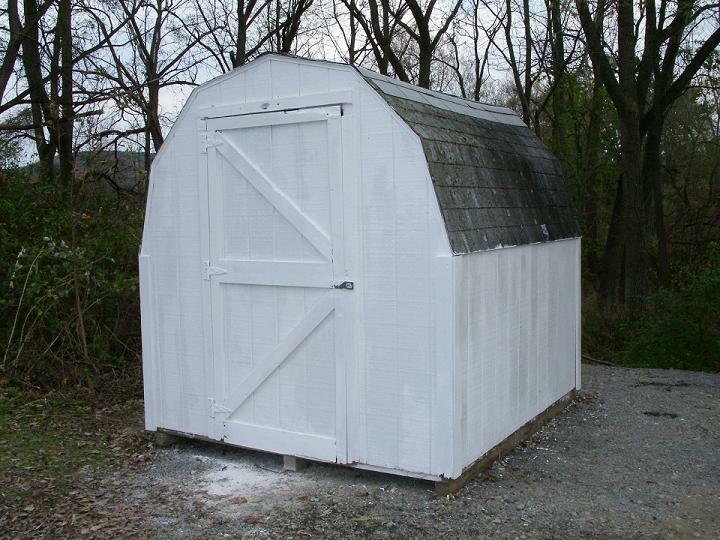 Look for this white shed to borrow a bike while visiting Sperr Memorial Park. Brendan’s mother, Kim Marshall, said Brendan was helped by six to 10 other Scouts and some Scout leaders in replacing some rotted boards and old shingles, installing shelving and hooks, and painting the shed and the bikes. “The boys really had fun painting the bikes so they’d stand out,” Kim said. She also said the trail around the park was busy the day Brendan and his friends were working on the shed, and the project drew a lot of interest. Sperr Memorial Park is a memorial to slain state Trooper Andrew J. Sperr, who was shot to death on March 1, 2006, by two fleeing bank robbers. The gunmen were captured later that day. Trooper Sperr would be proud of these young men, who have pledged to make a positive impact in their community. So go take out a bike and go for a ride around Sperr Memorial Park. It’s a great opportunity to enjoy our beautiful fall weather and celebrate the achievement of these fine young men and their families. To learn more about other bike share sites in Elmira, Corning and the Twin Tiers, visit the Southern Tier Bicycle League, and even better, become a member of STBL and help support great programs like this. The bike share project was supported by STBL, the town of Big Flats and a grant from the Community Foundation of Elmira Corning and the Finger Lakes Inc. This entry was posted in Bicycle sharing program, Bike sharing program, Cool Stuff for Bicyclists, Southern Tier Bicycle League, Uncategorized and tagged accident attorney, accident lawyer, bicycle accident, bicycle accident attorney, bicycle risks, Bicycle Safety, bike accident, Cycling, Eagle Scout, James B. Reed, Jim Reed, New York bicycle accident lawyer, ny bicycle accident, ny bicycle cases, pa bicycle accident, Scouts, Southern Tier, Twin Tiers, Ziff Law Firm on November 1, 2012 by Jim Reed. NY and PA Bicycle Attorney: Donate Your Old Children’s Bikes to Help Others! The Southern Tier Bicycle League would like your unused children's bikes. Calling all local cyclists in the Elmira, Corning, Horseheads, Waverly, Sayre and Ithaca areas! 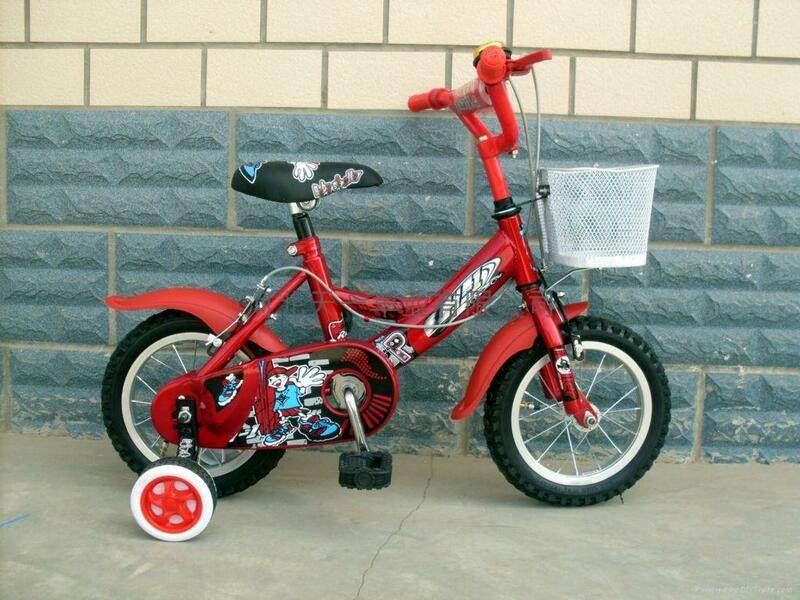 Do you have an old children’s bike in your garage that is just gathering dust and hasn’t been ridden in years? Would you like to feel good about donating that bike to a great cause? Then please consider donating the bicycle to the Southern Tier Bicycle League. 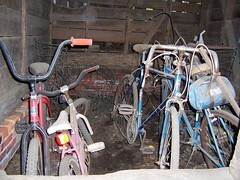 The League is looking for old bikes to refurbish and provide to area children in need. To help, call Bill Fischer at (607) 731-2737, send email to [email protected] or go to www.stblhelps.org. 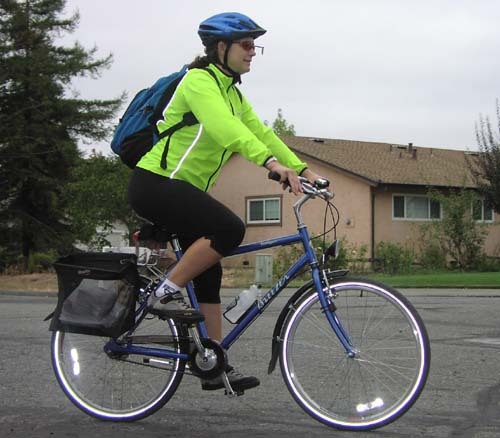 The mission of the League is to promote year-round bicycling in the area through educational and recreational cycling activities for people of all ages. This entry was posted in Bicycle Safety, Bicycle sharing program, Cool Stuff for Bicyclists and tagged accident attorney, Bicycle, bicycle accidenet laws, bicycle accident attorney, bike accident, Elmira New York, James B. Reed, Jim James B. Reed, Jim Reed, New York bicycle accident lawyer, ny bicycle cases, pa bicycle accident, pa bicycle law, Ziff Law Firm on June 14, 2011 by Jim Reed. 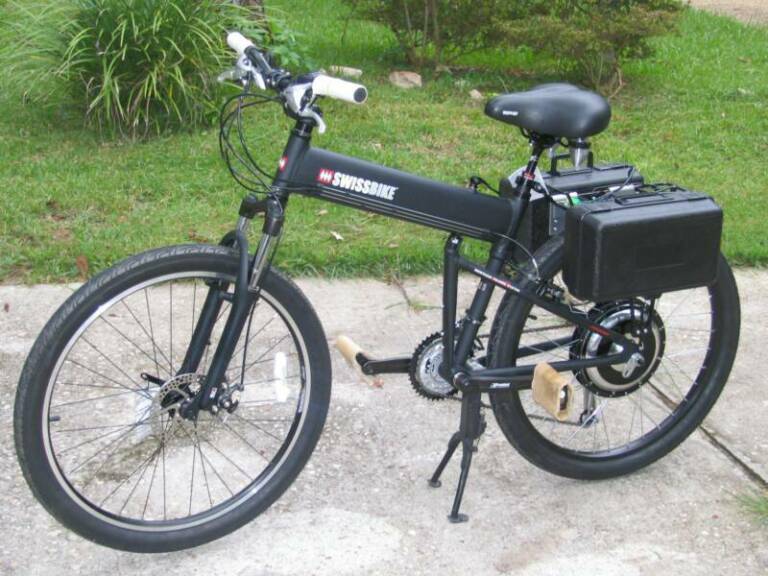 The Southern Tier Bicycle Club is gearing up its new bike-sharing program. My hat is off to the Southern Tier Bicycle League for its efforts in creating a free bike-sharing program in Watkins Glen and Chemung County. This is a super program that will help those of us in the beautiful Finger Lakes region of the Southern Tier get out on the roads to enjoying biking. Elmira, N.Y. – One Chemung County group is working to get you off the couch and out exploring your neighborhood. The Southern Tier Bicycle League unveiled a new bicycle share program. It makes bikes available to neighbors and visitors in the Southern Tier for free. The Southern Tier Bicycle League has opened a bike share in the City of Elmira. With four adult bikes and five children’s bikes, the program gives neighbors and visitors the chance to ride through the Southern Tier, free of charge. “It’s cheaper, you’re using less gas, and you’re able to get out and enjoy yourself,” said Kent Goben, the Southern Tier Bicycle League President. This is the second bike share to come to the Southern Tier; the League opened the first one at the Village Marina in Watkins Glen last fall. There are two adult bikes and four children’s bikes there. The bike pool provides two wheels to anyone who is interested, all you need to do is sign out a bike, buckle up your helmet, and return the bicycle by dark. The creators of the bike pool said this service isn’t just a way to encourage you to get out and about, but it provides visitors to the area an alternative way to explore the Southern Tier. 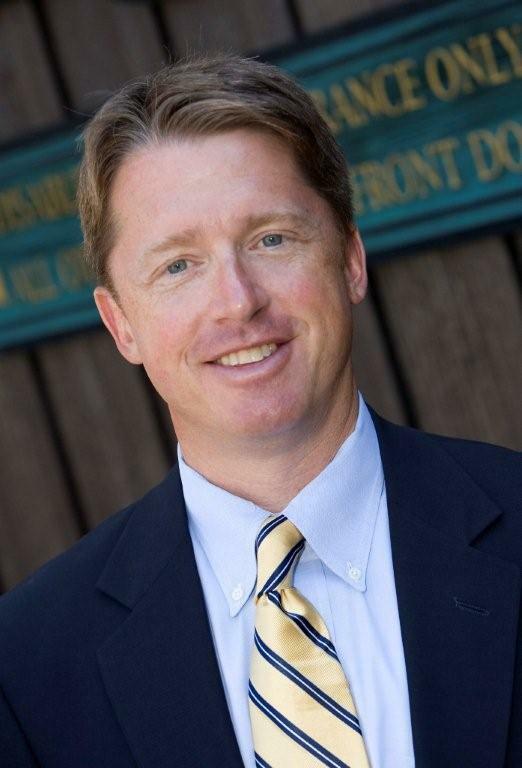 “I’ll advertise [the bike share] on my website and Facebook, that we have the ability to give our guests free bikes to use to go through the Historic District. Many people come to this area just for that reason; this way, they can stop and look at the houses and really enjoy it,” said Butch Monroe, the owner of the Painted Lady in Elmira. The business owners said having the bike share is an extra incentive they can offer their customers. The program is a first come, first serve basis, but you can reserve the bikes ahead of time. 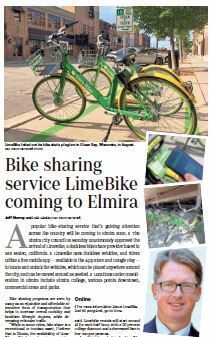 If you’re interested, you can call 607-733-6798 for the Elmira bike share, and 607-546-8505 for the Watkins Glen bike share. To learn more about the Southern Tier Bicycle League, click here. The site includes some great information, including a local schedule of events, safety information and many great links. Check it out! This entry was posted in Bicycle Collisions, Bicycle Safety, Bicycle sharing program, Bike sharing program, Cool Stuff for Bicyclists, Risks for Bicycle Riders and tagged accident attorney, accident lawyer, Bicycle, bicycle accident attorney, Bicycle sharing system, Cycling, James B. Reed, Jim James B. Reed, Jim Reed, New York bicycle accident lawyer, ny bicycle accident lawyer, pa bicycle law, Sports, United States, Ziff Law Firm on May 6, 2011 by Jim Reed.